Norwood is creating music videos & songs! The first patrons at ANY amount will receive a FREE copy of Norwood's BRAND NEW CD featuring 3 unreleased songs you can't get anywhere else! Hello! I'm Norwood, an international, American gay pop-artist from Atlanta, Georgia with a passion for singing and performing. Through my music I strive to entertain and make the world a better place. Visit www.norwood-music.com to hear my music and learn more about me! I've released several albums over the last few years (including two holiday albums! ), I create music videos online, and I've been privileged to perform at some really awesome events (most recently World Pride Madrid 2017 for a crowd of 3 million!). As an artist who is "coming of age" in the internet/digital media era, turning my passion into a viable living has required some creativity, a lot of side-hustle, and the support of my wonderful friends (like yourself)! Patreon is a great way to empower me to continue making the art you love! In return, you'll get to enjoy my creations before anyone else, get access to exclusive behind-the-scenes content, and cash in on some AWESOME rewards (check them out to the right)! I'm glad you asked! While we try to make it look effortless, creating music and art takes a lot of time, work, and cash. I'm blessed to work with a team of incredibly talented people (my manager, producers, photographers, videographers, dancers, musicians, choreographers, vocal coaches etc. ), and your support allows me to pay them fairly for what they do. It also helps cover travel costs on tour, fund new albums, and pay for recording equipment! I want to support your music, but I can't afford much...does $1 really make a difference? Can I pay in Euros/Pounds, etc? What kind of creations will you be making each month? I believe that variety is the "spice of life", so this will vary somewhat month-to-month. The most frequent uploads will be songs (either new originals or cover songs), music videos (originals or covers), LIVE performance videos, etc. How many songs/videos will you release per month? I will release a new song/video twice per month on average. If you'd like, you can set a maximum on your pledge when you sign up so you'll never go over your budget! I can't afford to be a Patron right now - can I stop? Absolutely, and there's no hard feelings - promise! You can login to your account to change or cancel your pledge whenever you want. The Early Bird gets the worm...or in this case, access to new content at least 24 hours before anyone else! Be the first to see new videos, songs, and other Norwood content exclusively here on Patreon! Access to the patron-only activity feed - see it before anyone else! Periodic digital and merchandise sales only for Patreon supporters! See what goes on behind-the-scenes! We will take you along for the ride on our Tour de Fierce European Tour this Summer with weekly vlogs ;) You get these vlogs a full week before anyone else! 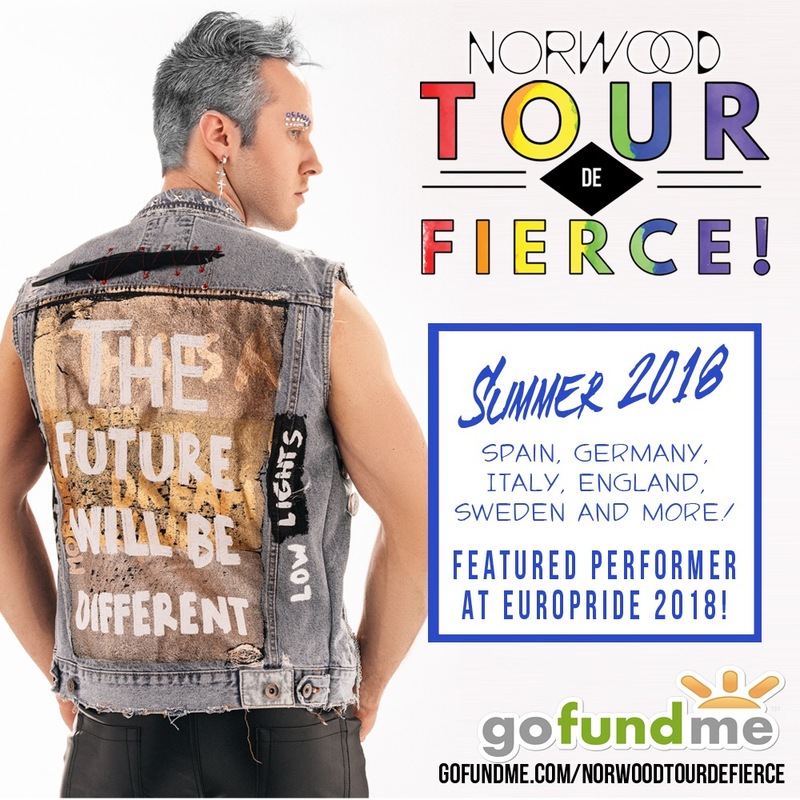 Exclusive weekly behind-the-scenes vlogs of Norwood's Tour de Fierce in Europe this Summer! Exclusive Tour de Fierce t-shirt! Your name in my video credits! ♫ We gonna party like it's ya birthday! ♫ Get a personalized special occasion video from Norwood! Use it for yourself, or a loved one! Great for birthdays, graduations, anniversaries - whatever you'd like! Norwood will even sing the chorus of your favorite song and dedicate it to the lucky recipient! 1 yearly personalized special occasion video from Norwood for as long as you're a patron at this level or above! Oh man. You've found it. The MAC DADDY of rewards...the Ultimate Pass! Get FREE downloads of Norwood's entire music catalogue (including all future releases)! You'll also be a VIP Member of Norwood's Culture Club - Norwood will send you a copy of one of his favorite books, movies, or albums every month for you to enjoy! FREE download of Norwood's entire MP3 catalogue (including songs no longer in circulation)! Membership in Norwood's Culture Club! Ok, if you're willing to support me this much, you really ARE an angel :) In addition to all of the above rewards, you will get two backstage passes to any show you attend (just give us a heads up), and a "special thanks" on my website. PLUS you'll be a part of the creative team - you'll get to hear demos of new songs, see rough cuts of new videos, and give creative feedback! Backstage passes (2) at shows you attend (subject to venue approval)! Be a part of the Creative Team! PATREON LAUNCH! For a limited time, the first patrons at ANY amount will receive a FREE copy of Norwood's BRAND NEW CD featuring 3 unreleased songs you can't get anywhere else!